Gucci opened Gucci Garden within the Palazzo della Mercanzia in Florence on January 10, just in time for this year’s Pitti Uomo trade show. Renovated by Alessandro Michele himself, the space holds several exhibition rooms overseen by critic and curator Maria Luisa Frisa, as well as a boutique filled with exclusive products, and a restaurant with the best chef in the world, Massimo Bottura, at its helm. 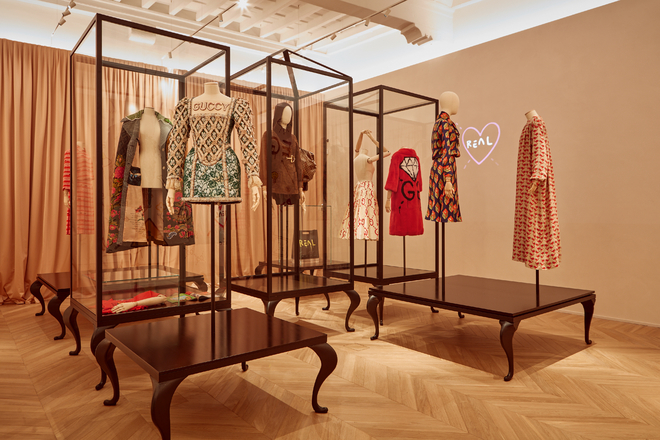 Now, for the 95th Pitti Uomo in January 2019, Gucci has unveiled its plans for a brand-new exhibition, after dedicating one to Alessandro Michele’s collaborations with the house the designer’s homage to Björk’s. Two news artists, succeeding the work of Coco Capitán and Jayde Fish, will present their new murals. Spread over two floors, the Gucci Garden highlights the history of Gucci, from its founding in 1921 to the present day, through a series of exceptional artefacts such as clothes, accessories, video installations and pieces of art. Each room explores the inspirations that were driving forces behind the house’s success, such as flora and fauna, one of Alessandro Michele’s favorite sources of inspiration and a recurring theme for several seasons now. Artists such as Coco Capitán, Jayde Fish and Trevor Andrew who all contributed to Gucci’s rise in the art world, have also contributed to the space, redecorating its walls with their unique artistic vision. Following the work of Capitán, Fish and Andrew, two new artists will take over the Gucci walls on January 8 2019, just in time for the 95th Pitti Uomo. The new exhibition will take over from the Björk-themed presentation currently in place.